One of the biggest safety problems for bikes and cars sharing the road is right hooks—drivers turning right crashing into cyclists, especially at busy intersections. Since 2008, Portland has tried to stop right hooks by painting green "bike boxes" at 11 problem intersections. But do the boxes actually make cyclists safer? Just this year, Portlander Kathryn Rickson was killed at an intersection with a bike box on SW 3rd and Madison and many people have complained that the bike box on NE Couch is still a right hook zone. A 2010 study found that the bike boxes make cyclists and drivers feel safer at the intersections, but we've never had hard data on whether the boxes actually reduce the number of crashes. Until now. Yesterday, the city released a depressing letter (PDF) to the Federal Highway Administration that shows the bike boxes may have actually doubled the number of crashes. In the four years leading up the installation of the bike boxes, there were 16 right hook crashes at the problem intersections involving bikes. In the four years since their installation, the intersections had 32 right hook crashes involving bikes. The vast majority of the new crashes—81 percent—occurred at just four of the eleven intersections, at SW 3rd and Madison, SE 7th and Hawthorne, SE 11th and Hawthorne, and NW Everett and 16th. At the other seven intersections, right hook crashes slightly declined. What appears to be leading to the new crashes in that people are biking through the intersection faster, overtaking cars that are turning right. While the bike boxes have been good at stopping right hooks when both the car and bike are starting up from being stopped at a light, 88 percent of the crashes happened at a "stale" green—not from a dead-stop but from a turning car striking a cyclist who's in motion, pedaling down the block and through a green-lit intersection. That's the kind of crash that killed Rickson this spring. It's not clear exactly why the new type of crashes are occurring—it could be that the bike box's documented effect of increasing the "perception of safety" actually leads to people biking or driving less hestitantly through the intersection because they think they're in the clear. So in some ways, our safety plan is making our streets less safe. What is the city going to do from here? Well, it looks like to make things actually safe, the city will have to invest in fixes that are more expensive and create larger traffic-flow change. The bike boxes are relatively cheap and easy: They cost less than $250,000 to paint at 14 intersections. For comparison, $250,000 is roughly the pricetag to install one traffic signal. At these most dangerous intersections, the city could install bike-only green light (like we have on the west end of the Broadway Bridge). They could potentially move the turning lane so that no cars turn right across the bike lane at intersections (like0 on the east end of the Burnside Bridge). They could ban right turns entirely when it could cause a crash (like how you can't turn across the bus-train lanes off the transit mall). They could install more dorky neon signs that explain how roads work (like on NE Couch and Grand). Those are all the kinds of options the city will be looking at as it digests the news that bike boxes aren't a silver bullet, and their letter to the feds says engineers will come up with a permanent plan for the intersections by 2013. 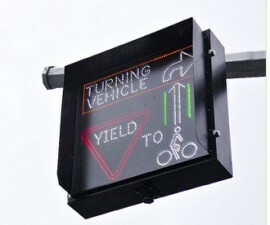 Until then, the city is planning to change the intersections in some smaller ways: Painting "SLOW" and "LOOK FOR RIGHT TURNS" in the bike lanes leading up to the intersections, changing the green paint to be a "broken" pattern, and updating the "yield to bikes" sign on the streets. As we continue to have this dialogue about safety improvements, it is important we have a clear understanding of when bicycle traffic will be given priority at intersections where there is the potential for conflicts between vehicles. How many people need to ride their bikes through a given intersection each day before we say, as a matter of public policy, “This is a place where everyone will be safe all the time; this is a place where we will provide safe separation, in both space and time, for different types of traffic”? We can get closer to achieving our vision of zero crashes, injuries, and fatalities when we have safe, physically separated facilities and exclusive red, yellow, and green signal phases for people on bikes. Also, it's worth noting that some of the increase in crashes is likely due to there being more bikes on the road—more people riding means more bike-involved crashes numerically, even though the rate of crashes has dropped citywide. There are about 6,000 more people riding now than there were in the four years before the study, shows city data, and the number of crashes citywide involving bikes grew from 188.5 annually in 2004-2007 to 292 annually in 2008-2011, an increase of 57 percent.